2015 Report on the Creative Economy Reveals that Los Angeles Metropolitan Area has the Largest Number of Creative Industry Workers in the Nation, Ahead of New York, Chicago and San Francisco. The Los Angeles region is the creative capital of the nation and the state. The findings of the 2015 Otis Report on the Creative Economy were released yesterday by Otis College of Art and Design at the Bob Hope Patriotic Hall in downtown Los Angeles where a launch event was hosted. Nobel Laureate Dr. Joseph E. Stiglitz addressed attendees, speaking on the economic inequality issues currently facing America. Michael H. Kelly, Executive Director of the Los Angeles Coalition for the Economy & Jobs, moderated a live Q&A with Dr. Stiglitz and Chief Economist Robert Kleinhenz of the Los Angeles County Economic Development Corporation (LAEDC) provided an overview of the report findings. Since its inception in 2007, Otis College of Art and Design has commissioned the LAEDC to generate the Annual Report on the Creative Economy of the Los Angeles Region (Otis Report). The Otis Report is an invaluable tool to assess the tremendous impact and influence of the area's creative sector on the economy. The Los Angeles region is the creative capital of the nation and the state. The Los Angeles metropolitan area has the largest number of creative industry workers in the nation, ahead of New York, Chicago and San Francisco. Over forty percent of the state’s workers in creative occupations are located in the Los Angeles-Orange County region. The net economic contribution of the creative industries to the Los Angeles regional economy (Los Angeles and Orange counties) was $109.1 billion in value added, which was equivalent to nearly 13 percent of the region’s gross product of $861 billion in 2014. The Los Angeles regional creative economy’s 418,200 direct wage and salary workers were equivalent to 8.4 percent of all 4.9 million wage and salary workers in the region during 2014. In Los Angeles County, total creative industries employment (direct, indirect and induced) accounted for nearly one in six wage and salary jobs in the county (or 18 percent of wage and salary employment) in 2014. The creative industries in the Los Angeles – Orange County region generated $7.7 billion in tax revenues (property, state and local personal income and sales taxes) in 2014, which was nearly 50 percent of the $15.5 billion in tax revenues generated by the creative industries in California. 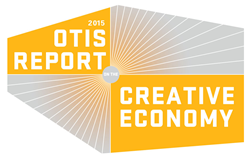 The 2015 Otis Report on the Creative Economy of the Los Angeles Region is available for download online at http://www.otis.edu/otis-report-creative-economy. The statewide 2015 Otis Report on the Creative Economy of California will be released later this year at a public hearing event in Sacramento, CA organized by the Joint Committee on the Arts. Funding for the 2015 Otis Report on the Creative Economy of the Los Angeles Region has been provided, in part, by the California Arts Council, Mattel, City of Los Angeles, Department of Cultural Affairs, and City National Bank. Event sponsors include DPR Construction, Arthur J. Gallagher & Co., Bon Appétit Management Company, Hirtle Callaghan, and Moss Adams LLP. Additional support provided by Marsh. Media partners include Artbound KCETLink, Arts for L.A., Arts Orange County, Californians for the Arts, and LAX Coastal Chamber of Commerce. Established in 1918, Otis College of Art and Design is a national leader in art and design education. The College mission is to prepare diverse students of art and design to enrich our world through their creativity, skill, and vision. Alumni and faculty are Fulbright, MacArthur, and Guggenheim grant recipients, Oscar awardees, legendary costume designers, leaders of contemporary art movements, and design stars at Apple, Anthropologie, Patagonia, Adobe, Pixar, DreamWorks, Mattel, Nike, and Disney. Otis enrolls approximately 1,100 full-time students, and offers Bachelor of Fine Arts degrees in Architecture/Landscape/Interiors, Digital Media (Game and Entertainment Design, Animation, and Motion Design), Fashion Design, Communication Arts (Graphic Design, Illustration, and Advertising Design), Fine Arts (Painting, Photography, and Sculpture/New Genres), Product Design, and Toy Design. Otis also awards the Master of Fine Arts degree in Fine Arts, Graphic Design, Public Practice, and Writing. The five-acre main campus is located on L.A.’s Westside near the beach and LAX; the Graduate Studios are in nearby Culver City, and in the 18th Street Arts Center in Santa Monica. 2,700 adults and children participate in Continuing Education art and design classes and workshops.